The Secular Student Alliance has numerous resources to help our advisors better support their groups. You may also want to explore the Group Running Library, which offers resources on a huge range of group-running topics, or our Group Running Guide - the handbook we issue to all affiliate leaders. Many chapters have existed for so long that they have established an institution on that campus, rather than simply a student group that fades in and out between leadership transitions. In your role as a group’s advisor, you provide one of the best ways to preserve your chapter's institutional memory. What is the best way for an advisor to engage with, and support, the secular student group that they advise? This is a very good question without a simple answer. It fully depends on the attitudes and goals of the group, the group’s leaders, and you as the advisor. It might take some trial and error to find the most successful niche; however, we can help you out! What would student leaders like their advisors to do or help out with? We have that information here for you, based on both advisor and student feedback! Corinne Zimmerman is a professor of psychology at Illinois State University and advises the SSA chapter there. In this video, she discussed ways to help transition leaders out of their leadership roles to ensure a healthy group. Scott Whitfield describes the role he fills as advisor to the College Free Thought Society at UW Eau Claire, and how that role differs from advising other groups. Check out the video here. Getting your SSA affiliate group to work with local off-campus groups can be very beneficial to everyone involved. Check out some suggestions and advise on how to do that! 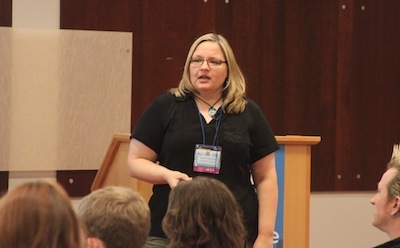 Kathy Goodman, a researcher on nonreligious college students, presents at our 2012 Annual Conference about ways to make a campus more welcoming to secular students. Watch the video! Advisors have strong influence over the tone of a campus group. In this video, Amy Young discusses how she used this power for good at the 2012 Annual Conference. One of our best resources to find out what works and what doesn't is you! Share your own list of dos and don'ts with us! You can email us at organizer@secularstudents.org.